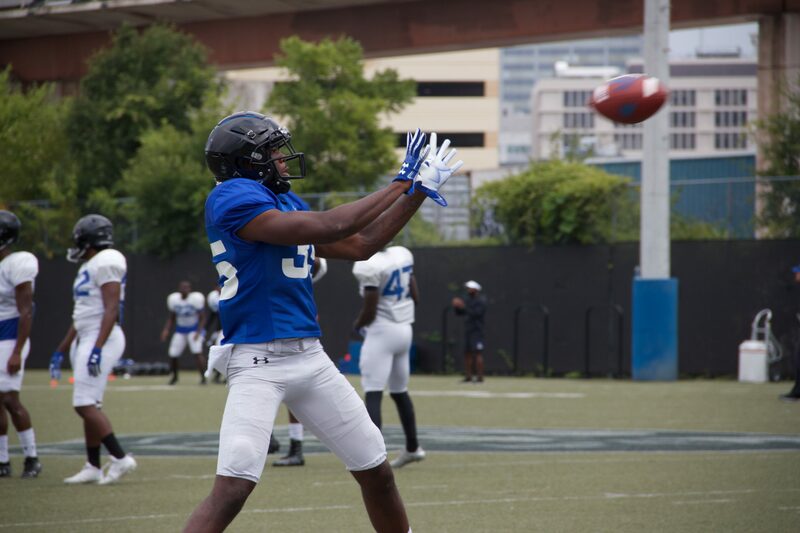 Competition in sports is a good thing, and the Georgia State football team has plenty of it as it ends fall camp and heads into its first game against Kennesaw State. The Panthers will have a very young team and new starters at different positions around the entire field. First, on the offensive side of the ball, everyone knows that there is a battle for the starting quarterback position, but the race for starting running back is up for grabs as well. Three freshmen are fighting for the job: Seth Paige, Dawson Hill and Destin Coats. There are also some veterans like Tra Barnett, Demarcus Kirk and Taz Bateman. Bateman has recovered well from an ACL injury and has impressed the coaching staff in the offseason. The current running backs on the roster combined to rush for 365 yards last season. On the defensive side of the ball, the Panthers will have to replace seven starters. Top cornerbacks B.J. Clay and Chandon Sullivan are off to the NFL, and their jobs will need to be filled. The Panthers do return lockdown corner, Jerome Smith, but who starts across the field from him is still up in the air. Clay and Sullivan combined for 53 tackles, one interception and eight pass breakups in 2018. Starting safeties Bryan Williams and Antreal Allen are also both gone. Williams recorded 62 tackles, four interceptions and two pass breakups last season. Allen contributed 37 tackles and one interception. Those two were formidable safeties for the Panthers and will be tough to replace. Georgia State does have senior DeAndre Applin returning, but they need to find another person to fill in next to him at the other safety position. Along with the secondary, the defensive line and linebacking core will have starters to replace. Defensive end Marterious Allen and linebackers Chase Middleton Jr. and Michael Shaw are the only returning starters from the front seven. The backups from the other four spots return, so they were able to get valuable minutes last season. The Panthers lost some key veterans from last years group, but they had a good recruiting class this year and were able to get playing time for some freshman last season. So, the hope inside the program is that the gap between the current players and the graduates isn’t so large during the season.